The stories in Friday Black are volatile, unpredictable concoctions. While reading them, I imagined author Nana Kwame Adeji-Brenyah as a mad scientist, mixing beakers with wild abandon: some societal critique here, a little gallows humor there, a dose of dystopian sci-fi just for kicks. The resulting stories feel just as likely to combust as they do to end. Adjei-Brenyah is among the most exciting new voices in fiction I've encountered all year, the heir apparent to Vonnegut and Saunders's tradition of dark, socially incisive postmodernism. Once you start in on "the Finkelstein 5", you will not be able to put this down. This story will grab you, enrage you, and break you while you chant along in a radical cry for justice. 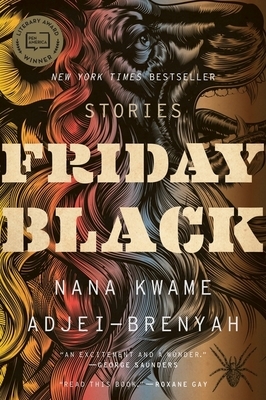 Adjei-Brenyah's voice rings powerful and true throughout this collection of stories. Satirical, heartbreaking, and violent stories set just within reach of "dystopian", but oh so relevant today.